Kl. 10.15: Prøveforelesning med oppgitt tema: “BAW and SAW components for mobile phones – A comparison". Kl. 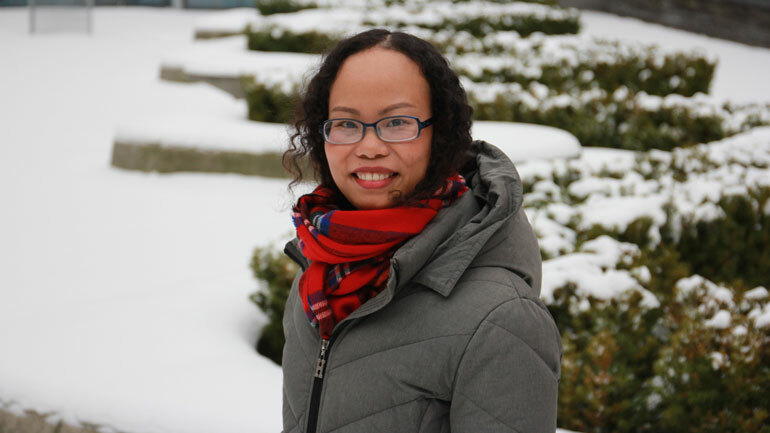 12.30: Disputas: Ngoc Thi Bich Nguyen forsvarer sin avhandling “High-Q bulk acoustic wave resonators for RF filter applications”. The present work proposes a novel design method for improving the quality (Q) factors of bulk acoustic wave (BAW) resonators used in radio frequency (RF) filters in mobile communication systems. Each filter is responsible for selecting the air-travelling electromagnetic signals that contain information in a given frequency band. Due to the limited frequency spectrum resource and increasing operating frequency bands, the filter is demanded to have a very high selectivity, for which high-Q resonators are key elements. Degraded Q factors in BAW resonators are caused by energy losses. In this work, the loss induced by lateral leakage of Lamb waves at the edge of a resonator is alleviated so that a high Q factor at anti-resonance frequency can be obtained. This is done by systematically modifying the resonator geometry. That is, a frame with two steps, serving as a lateral acoustic mirror, is placed atop the periphery region of the resonator. Lamb waves when encountering this mirror bounce back so acoustic energy could be confined within the resonator area. The key feature of this mirror is the ability to simultaneously reflect two wave modes, making it more efficient in reducing the amount of leaking energy. By applying the proposed method, the improvement of the Q factor, evaluated via numerical simulations, is achieved for both types of BAW resonators: thin film bulk acoustic (FBAR) and solidly mounted resonators (SMR). The inclusion of more filters in modern mobile handsets with limited sizes suggests a device miniaturization. The impact of a reduced area on the working frequencies and performance of BAW resonators is thus also investigated. The effects of a micro variation in the resonator area on its Q factor at antiresonance frequency during numerical simulations are also determined. The work also covers the fabrication process and measurements of three different non-framed SMR designs. For each design, the SMRs are fabricated in various sizes so that the dependence of their performance parameters on area is studied.